Start Out the New Year Right! Confess: did you go to the gym on New Year’s day? Was it crowded? Of course it was, everyone wants to start out the New Year right. Work out, eat healthy, be generally awesome. All these 30-day challenges started showing up in my social feeds, I figured: am I the only one to not do one? That’s just wrong. But then, how to decide on a challenge? Do I want to start out 2014 by planking for a month? Ab challenge? Fitness challenge? Pushups? Lunges??? I struggled with this difficult choice, until I found just what I needed: So there you have it, the Nap Challenge for January 2014. Who’s with me? Since we’re already five days into it, you’d have some catching up to do, but I hope we’ll be able to get through it! Seriously, though, this isn’t too far from the truth for me so far. Today’s the last day of a recovery week, which in long-course triathlon seems to be pretty radical – compared, at least, to the marathon training plans I’ve used before. All week, I’ve been doing 30-minute runs and easy rides, not to mention 1,000-yard swims. I had a half-hour ride on New Year’s eve, followed by a half-hour run, then a 1,150 yard swim and a 30-min ride on New Year’s day. Let’s just say, a recovery swim was never more aptly named! Now I’m off to do a 60-minute “long” run. As for the Nap Challenge, it’s a “rest” day. Enjoy! 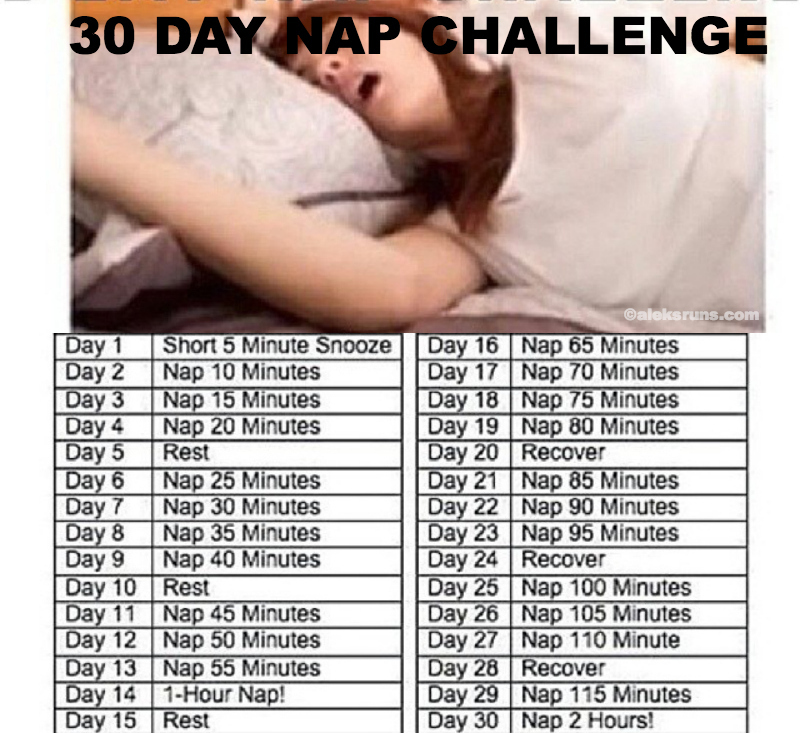 Haha, I love that nap challenge. I saw someone post that on Facebook and literally LOL’d.